Buried in the business section of today’s New York Times is a story with some very encouraging news about the future of quality journalism. The story concerns the New York Times Company itself. There’s a lot of noise in there about the sales of assets such as About.com. There’s also the usual gloomy news about the continuing declines in print advertising (down 5.6 percent). 1. Digital advertising revenues rose 5.1 percent. That’s the money the Times makes from selling the electronic ads that appear in the online version. They are rising from a small base, to be sure, but they represent the ad dollars of the future. 2. The biggest good news: revenue from circulation grew 16.1 percent. In other words, the Times‘ paywall is paying very well. I would say this story “buried the lead” — because this is the biggest news in a while. The increase in circulation revenue is certainly not coming from a surge in subscriptions to the old-fashioned print version of the paper; nor is it from an upswing in newstand sales. It is coming from people who bump into the Times‘ online “paywall” and decide that it’s worth paying for the Times‘ content online. That may well turn out to be the paper’s salvation: the readers. Paid subscribers to The New York Times and the International Herald Tribune digital subscription packages, e-readers and replica editions totaled approximately 640,000 as of the end of the fourth quarter of 2012, an increase of approximately 13 percent since the end of the third quarter of 2012. That’s impressive. Readers in those numbers (plus some more, of course) could carry the paper into the digital future. Can a restored dividend be far behind? Here’s a chart of the company’s stock performance. 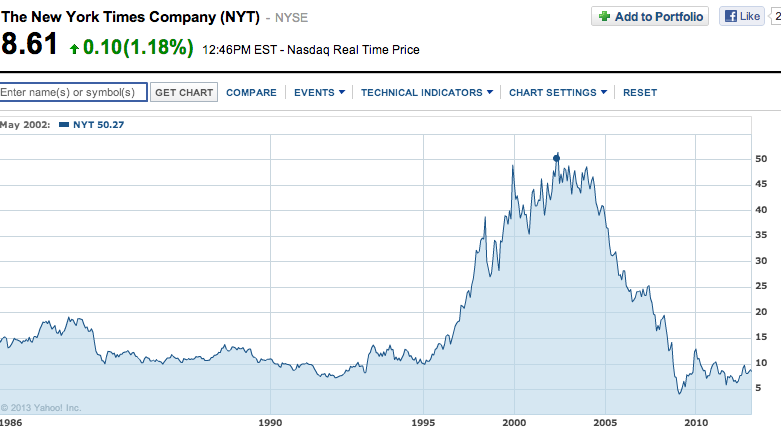 NYTCo stock is up today, but it has a long way to go to get back to the glory days of a decade ago.